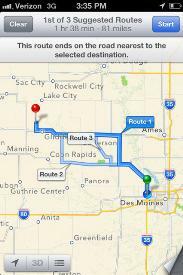 With maps and reports saved to a phone or tablet, there is the convenience of having data available at all times, whether there is an Internet connection or not. Users can define which applied maps and specific reports they would like to save to their phone or tablet, so that only the information important to them is available. Users of John Deere Mobile Farm Manager are able to share information from one mobile device to another, quickly and easily, from any location with a cellular signal. The share feature allows users to share layers and maps with anyone they choose and dictate the length of time that recipients can access the data. Users can choose to share data for seven, 30, or 365 days. For customers wanting to share data on a more permanent basis, they can choose an option to never expire the data. iPad is a trademark of Apple Inc. Android is a trademark of Google, Inc. 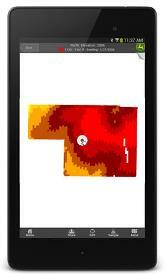 Mobile Farm Manager can define soil grids and track the sample numbers from a phone or tablet. By using a boundary already saved to the device, users can quickly and easily define the parameters in which they would like to pull soil samples. By using the global positioning system (GPS) on the phone or tablet, users can easily see when they have reached new sampling zones and identify from where they took samples. Mobile Farm Manager also allows either automatically incrementing sample numbers or user-defined sample characters that can be written on the bag so that results from the soil testing lab can be easily associated to the appropriate sampled area. The soil sampling data can be transferred to Apex™ software to review the results. iPhone is a trademark of Apple Inc. Android is a trademark of Google, Inc.
turn-by-turn directions from the user's existing location or a separate location. 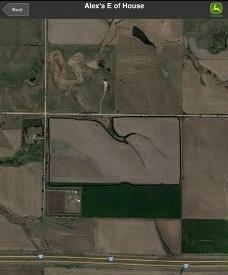 As long as an operation layer or boundary is available, directions to those fields will be at the user’s disposal. Evaluating field locations, intersections, and aerial view is now possible on the go with John Deere Mobile Farm Manager. Quickly and easily view field boundaries overtop an aerial image, which will also indicate its proximity to labeled roads and intersections. John Deere Mobile Farm Manager is capable of allowing users to document what they are seeing in the field and where they are seeing it. 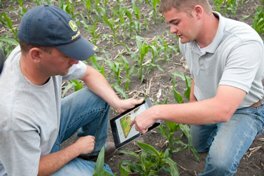 Using the crop scouting tools, users are able to use the GPS in their mobile devices to link crop scouting events, notes, and pictures to a geospatial location. Information gathered in Mobile Farm Manager can be immediately shared with consultants, partners, and sent to Apex for further review. Enjoy the access to Apex maps and reports on Android platform in addition to iOS®-compatible mobile devices. Broadening access to data from Android-compatible smartphones and tablets in addition to the already existing iPad® and iPhone® devices. John Deere Mobile Farm Manager for Android will have a one-time activation fee. Activations can be purchased for Mobile Farm Manager with the following base code - 0291PC. Once purchased, the activation is entered into Apex and will enable data to be sent to and from a mobile device to Apex. Every purchase of Mobile Farm Manager will unlock two copies of Apex. Dealers can receive demo activation for John Deere Mobile Farm Manager with the following base code - BPF10636. Customers are able to download John Deere Mobile Farm Manager from Google Play® or the Apple® App Store at no cost. 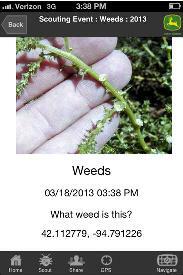 They will only have access to Demo data in the app to discover and learn more about Mobile Farm Manager App. They will not be able to transfer their own Apex data to and from Apex until they purchase the activation using the base code – 0291PC. Apple, iPad, and iPhone, are trademarks of Apple, Inc. IOS is a trademark of Cisco Technology, Inc. used under license by Apple, Inc. Android and Google Play are trademarks of Google, Inc.